"This is surely the most dramatic of all world records, the oldest and most famous record in world motorsport, with a fabulous history of great record holders. I am very, very excited by the opportunity to meet this challenge - to drive through the speed of sound and reach 800 mph. This is a great goal - and we have the car to achieve it." The target for Fossett’s newest challenge is the current record of 763 mph, set in 1997 by Britain's Andy Green, driving the twin-turbojet powered Thrust SSC. Fossett’s dart-like vehicle is 47 feet long and weighs 9,000 lbs – looking much like a single-seat jet fighter without its wings. Power is from a single, after-burning J-79 turbojet developing 22,650 lbs of thrust (45,200 hp) formerly fitted to a USAF F-4 Phantom fighter-bomber. The car was originally designed and built by five-time land speed record-holder Craig Breedlove for an unsuccessful 1996/97 LSR campaign, and is currently undergoing chassis modifications and aerodynamic development under Fossett's team, led by project director and aerodynamicist Eric Ahlstrom. The Reno, Nevada-based programme will see the car ready for the 2007 LSR season, with record attempts planned on a Nevada dry lake next July - October. "The Land Speed record is as old as the automobile itself,” continues the man with Le Mans experience. “Why do I want to break it? Think of the great names of the past - Campbell, Breedlove, Arfons, Noble... Think of magic milestones like 300 mph, 400 mph, 500 mph, 600 mph and the first supersonic record set nine years ago. Every car crazy kid - and adult - knows this history. "My objective is to push this record to 800 mph - and beyond. We certainly don't underestimate the challenges involved. Thrust SSC's achievement is very impressive. Stability and balanced aerodynamics will be key. At transonic speeds the forces acting on even a large aircraft are substantial. Imagine those same forces on a relatively small vehicle traveling only inches above the desert floor. We have set out a progressive series of test milestones, and we will gather and evaluate data as we build up speed gradually. We are prepared to carry on beyond 2007 as well." A title sponsor is being sought and television documentary and publishing rights are also already under discussion. 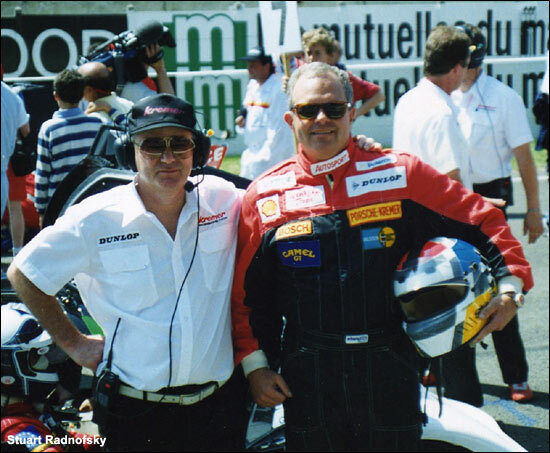 Here's Steve Fossett, with the late Erwin Kremer, at Le Mans in 1993.